Summary: Examining postmortem brains, researchers discover the state of glia remains consistent as we age and could be used to predict a person’s age at death. The difference between an old brain and a young brain isn’t so much the number of neurons but the presence and function of supporting cells called glia. In Cell Reports on January 10, researchers who examined postmortem brain samples from 480 individuals ranging in age from 16 to 106 found that the state of someone’s glia is so consistent through the years that it can be used to predict someone’s age. The work lays the foundation to better understand glia’s role in late-in-life brain disease. There are three types of glia cells, each providing different kinds of support to neurons: oligodendrocytes insulate, microglia act as immune cells, and astrocytes help with neuron metabolism, detoxification, among many functions. Based on analysis of human brain tissue samples, primarily from the UK Brain Expression Consortium, the researchers show that astrocytes and oligodendrocytes shift their regional gene expression patterns upon aging, (e.g., which genes are turned on or off) particularly in the hippocampus and substantia nigra–important brain regions for memory and movement, respectively–while the expression of microglia-specific genes increases in all brain regions. 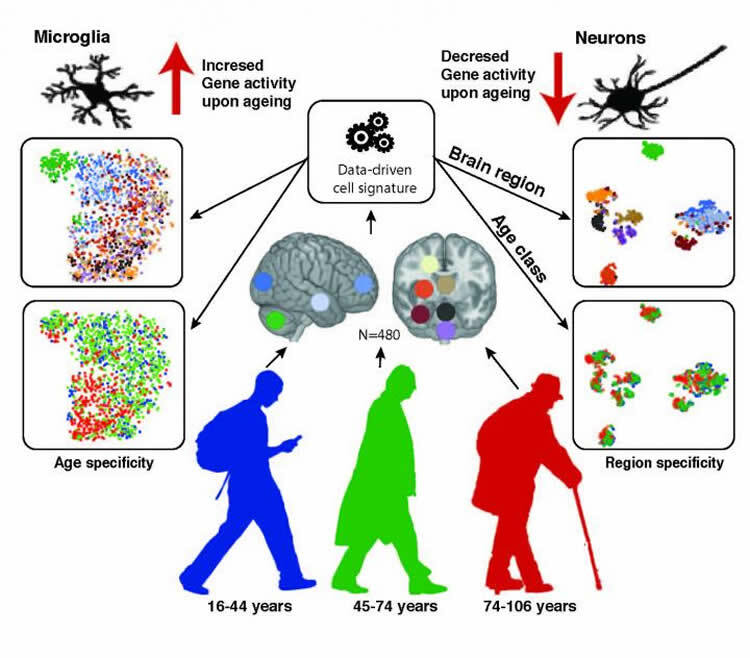 This graphic depicts the numbers and function of glia and neurons in the aging human brain. NeuroscienceNews.com image is credited to Lilach Soreq. One unexpected finding was that certain glial gene expression patterns could predict age in the general population. While this can only be done postmortem, and certain people will not fit neatly into these patterns, it does provide scientists one more tool to understand how aging in the brain may be linked to the causes of age-related disorders. The researchers’ ultimate goal is to see whether gene mutations or other variables could affect gene expression in ways that cause disease. Funding: This work was supported by the European Research Council; the Marie Curie Intra European Fellowship and Alzheimer’s Society for Junior Investigator award, the Francis Crick Institute, the UK Medical Research Council, the Wellcome Trust; the UK Medical Research Council; and the US National Institute on Aging, NIH. Image Source: NeuroscienceNews.com image is credited to Lilach Soreq. Cell Press “Glia, Not Neurons, Most Affected By Brain Aging.” NeuroscienceNews. NeuroscienceNews, 10 January 2017. Cell Press “Glia, Not Neurons, Most Affected By Brain Aging.” http://neurosciencenews.com/glia-brain-aging-5902/ (accessed January 10, 2017). Gene expression studies suggest that aging of the human brain is determined by a complex interplay of molecular events, although both its region- and cell-type-specific consequences remain poorly understood. Here, we extensively characterized aging-altered gene expression changes across ten human brain regions from 480 individuals ranging in age from 16 to 106 years. We show that astrocyte- and oligodendrocyte-specific genes, but not neuron-specific genes, shift their regional expression patterns upon aging, particularly in the hippocampus and substantia nigra, while the expression of microglia- and endothelial-specific genes increase in all brain regions. In line with these changes, high-resolution immunohistochemistry demonstrated decreased numbers of oligodendrocytes and of neuronal subpopulations in the aging brain cortex. Finally, glial-specific genes predict age with greater precision than neuron-specific genes, thus highlighting the need for greater mechanistic understanding of neuron-glia interactions in aging and late-life diseases.